Setting: Evidently this woman and her family were involved in one of the churches that John was overseeing-they had developed a strong friendship with John. John was warning her of the false teachers who were becoming prevalent in some of the churches. I. A New Reason for Rejoicing (v. 4). II. A New Level of Life (vv. 5, 6). III. A New Source of Danger (v. 7). IV. A New Basis of Appeal (v. 8). V. A New Need for Watchfulness (vv. 9–11). New Geneva study Bible. 1997, c1995 (electronic ed.) 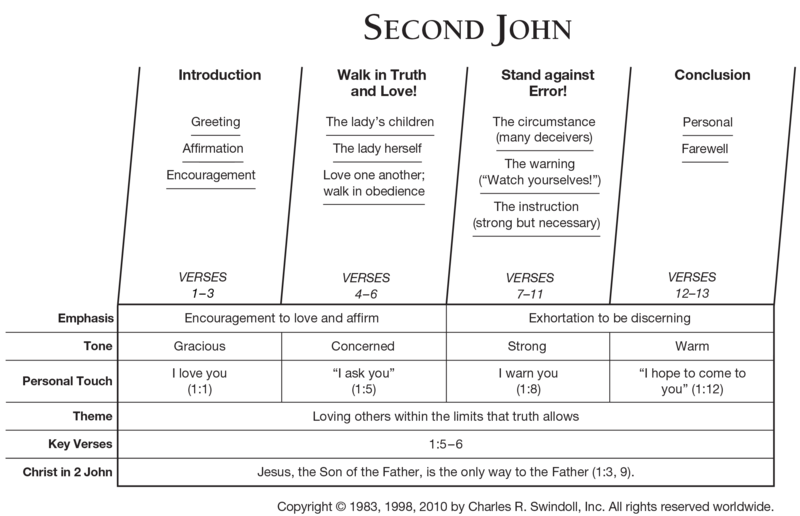 (2 Jn 1). Nashville: Thomas Nelson. False teachers were dangerous problem for the church to which John was writing. His warning against showing hospitality to false teachers may sound harsh and unloving to many today. Yet these men were teaching heresy that could seriously harm many believers - for eternity.